Here at Colostomy UK we firmly belive that having a stoma should be no barrier to a full and active lifestyle. A great example of that has been our Rugby League team. 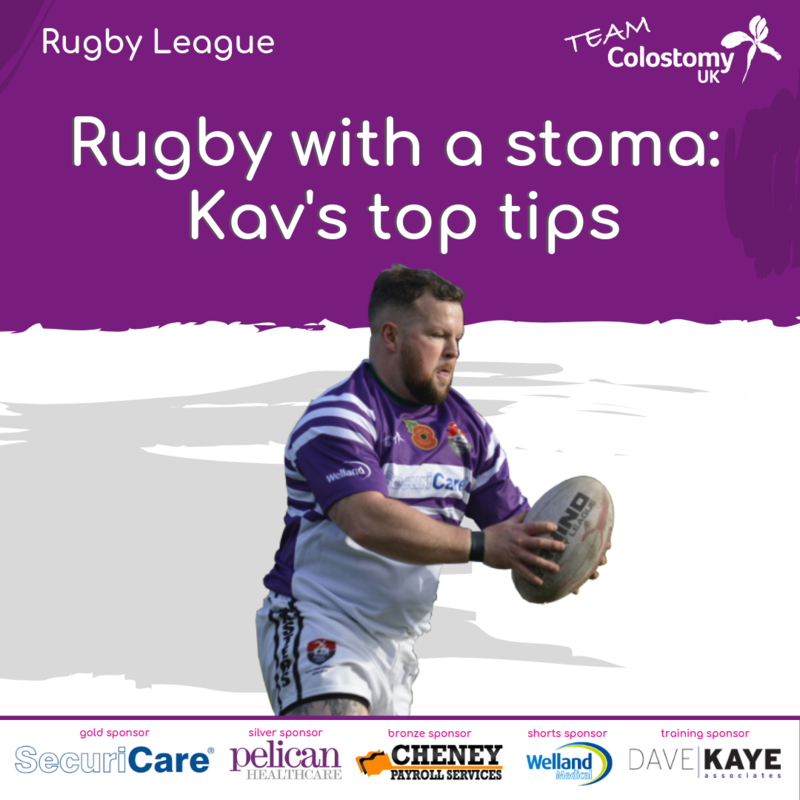 We talked with the team’s nippy half-back Kav on how exactly you play rugby with a stoma. I was diagnosed with ulcerative colitis in 2014, unfortunately no treatment was working for me and so I had surgery the following year in September 2015 where an ileostomy/stoma was formed. How long after your operation did you feel confident to start exercising? After my operation I’d lost about four stone and really felt like I needed to get some body confidence back. I eased myself back into the gym about 10 weeks after, starting with light weights & bits of cardio. I built this up and eventually progressed to running and heavier weights. I eventually joined in at my rugby training when I wasn’t helping out with coaching, but it wasn’t until August 2016 that I stuck a shirt back on for Chorley Panthers. I built up my confidence very slowly and took things at a steady pace. What are the practical steps to playing rugby with a stoma? I’d say the main one is knowing your limits, and not over doing it. I always make sure I’ve warmed up and stretch before partaking in any exercise. Confidence is key, as it is in anything. If I wasn’t confident in myself and confident in my ability then I simply wouldn’t play. I also make sure I have a fresh bag on, I normally change the night before a game or in the morning before it. Do you use stoma belts/stoma guards? What is the difference? I do have a stoma belt, but I only use that for the gym. I find it uncomfortable playing rugby in it though. When I’m playing I normally just wear a normal lycra Nike Pro top, teamed with either a support vest. With these 2 combos I normally forget, to some degree, about my stoma and concentrate on the task of playing. Have you ever had a hernia/been worried about a hernia? I’ve been worried about hernias yes. I wish someone had of told me more about the risks before and after surgery. It wasn’t something I was told or warned about that much. I do have a small hernia that has developed on one of my scar sites from the operation, but the doctor’s advice is that it is nothing to worry about as it was small and did go back in. Would my bag burst….technically no! Could the bag come off or away from my skin possibly yes…but it hasn’t happened to me whilst playing! I remember I got tackled perfectly in the midriff, like it couldn’t of been placed any better on my stoma. And my initial thought was “This is going to hurt in a minute”…but nothing, I had no pain in it whatsoever, which ofcourse was a big relief! You can see Kav and the rest of our Rugby League Team in action on Saturday 22nd April when they take on Medway Dragons.